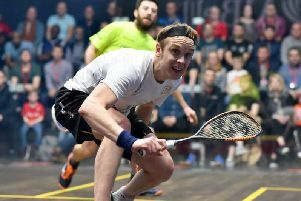 GRAND STAGE: Nick Matthew and James Willstrop play their first round match in the Tournament of Champions in front of a crowd at New York's Grand Central Terminal. Picture: PSA. AIMING HIGH: James Willstrop stretches for the ball in his battle with Nick MAtthew in the Tournament of Champions. Picture: PSA.